BHRC calls for the release of Amnesty Turkey director and the Istanbul 10. BHRC has sent an open letter to the Minister of Justice in Turkey calling for the release Amnesty Turkey director Idel Eser and the “Istanbul 10”. On 5 July, 10 human rights defenders, including the director of Amnesty Turkey Idel Eser, were arrested and accused of ‘committing crimes as part of a terrorist organisation without being a member.’ While four of those detained had been arrested, 6 of the “Istanbul 10” have been charged with crimes related to terrorism and detained. Reports suggest that the Turkish government is attempting to link them to three unrelated and opposing terrorist organisations. 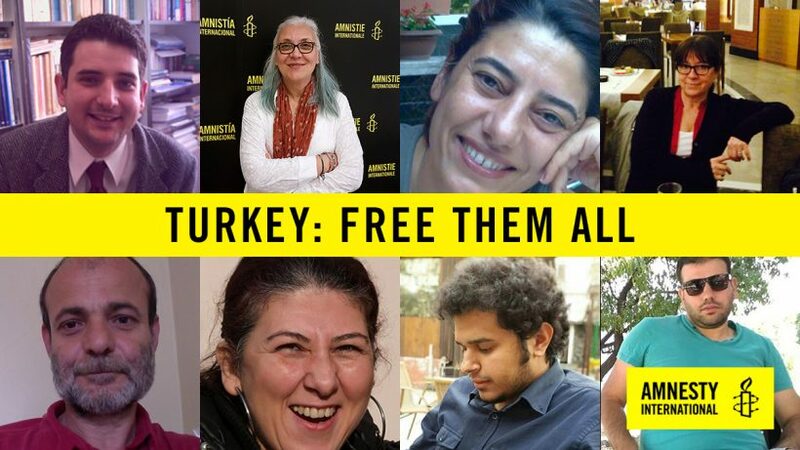 The six who remain in custody—Günal Kurşun, Özlem Dalkıran, Veli Acu, Ali Gharavi and Peter Steudtner—join the chairman of Amnesty Turkey, Taner Kilic, and thousands of others who have been arrested and arbitrarily detained since the failed coup of July 2016. To date, more than 50,000 people have been detained and accused of ties to ‘Fethullahist Terrorist Organisation,’ including nearly 2,500 members of the judiciary and dozens of journalists. An additional 169,000 are accused of ties with terrorist organisations but have yet to face legal proceedings. Fulfil its obligations under international law to uphold the rule of law in Turkey and protect the fundamental rights of all persons to peacefully assemble and engage with civil society.